Pterygium has a characteristic shape as it is triangular, with the base of the triangle located in the conjunctiva and the apex of the triangle encroaching onto the cornea. With corneal involvement, even if arrested surgically, a pterygium can affect vision by warping the surface of the cornea and inducing astigmatism, and/or by actually growing over in front of the pupil and obstructing the entering light. 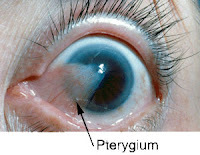 Pterygia seem to occur more frequently in people who spent much time outside, and is especially common in the southern lattitudes "Some consider pterygium as an occupational disease" So protecting the eyes from sun, dust and wind and use of lubricating drops is the standard treatment.